You are currently browsing the tag archive for the ‘Clif Clendenen’ tag. Aside from a few letters of unnecessary tone from both sides, I’ve really appreciated the Second District Supervisor discussion this time around. We have some very articulate writers. Some long winded (including me – I didn’t realize quite how long winded until I saw how much space I took up in the paper, and believe it or not I condensed!). Some very thoughtful. Some not so thoughtful. Anyway, The Redwood Times has its letters up. I wrote a separate letter for each paper, and unfortunately the Independent isn’t yet online and I keep forgetting to thumb drive the first letter from my offline computer. Unfortunately, that’s as far as the links go. There were some great letters over the past month. So what will happen on Tuesday? I’ll give you my predictions on Monday evening. Addendum: The Arcata Eye was kind enough to compile its letters of support for candidates. None in the Second District. Lots of support for Mark. Second addendum: More letters from this week’s paper. I know it tends to be feast or famine for my posting on anything lately. I hadn’t posted in almost a week, but today I’ve posted three times. I’ve a fairly full schedule, so I have to make hay when the sun shines. First of all, tonight on the HumCPR show Charley will host a discussion with both Clif and Estelle about General Plan and other land use issues. That’s on KMUD at 7:00 p.m., and it’s a call-in show. Don’t miss the debate at the Mateel this Sunday, with all of the information through this link. I am billed as a moderator, but Ed will be handling it alone as I’m committed to coach an Indoor Soccer double-header due to changes in scheduling. Ed is more than capable, and it should be a great debate. It will be simulcast on KMUD beginning at 3 p.m.
A little bit of controversy with the Democratic Central Committee last night, at least as far as Richard Marks is concerned. I wasn’t there, and I haven’t heard anything other than what is reported by Richard, but he seems to feel that Estelle was denied an endorsement because of her affiliation with HumCPR. Clif doesn’t qualify for endorsement as a member of the DTS Party, and Richard feels that as the only Democrat in the race she should have received the endorsement. In the thread he complains that Roy Curliss was denied the endorsement several years ago (when running against Carlos Quilez, a liberal Republican (a dying breed) for the same reason (and I don’t recall Carlos getting the Republican endorsement – probably over the same issue). Policies around development are a source of division in counties around the state, and Democrats tend to favor controlled growth advocates in their endorsements to the disappointment of union reps who emphasize jobs. It’s not a new issue locally or statewide, but I expect that HCDCC elections to become a little more politicized for awhile. Cheryl Seidner and Mark Lovelace each received endorsements. Lastly, although I’m now thoroughly bored with the topic, the billboard controversy is apparently covered in the Beacon-insert of today’s Times Standard. I can’t find it online, but if I do I’ll link to it. From what I’ve heard, it adds nothing new to the story. Again, there are at least half a dozen ways to cheat on these polls, and even if nobody cheats or rallies to “freep” them, the polls are only an indication of the sentiments of those who read blogs and respond to polls – which may not be anywhere close to representative of voters as a whole. Moreover, I have no way of limiting the responses to the districts in question or even the county. To quote Brit Hume, these polls may be “indicative of something.” If that. I post them out of pure curiosity, and for discussion purposes. Please join me as I formally announce my candidacy for re-election for Second District Supervisor this upcoming Friday, November 18, 2011 at 5:30 PM. We’ll be at Clendenen Cider Works at 96 12 St., Fortuna (take 12th Street Exit into town, turn left and you’re there). Supervisor Jimmy Smith has graciously offered to “introduce the candidate.” After the announcement, we’ll have hors d’oeuvres, beverages and time for conversation. Remember the complaint filed against Clif Clendenen for having an apple orchard too close the the railroad tracks? 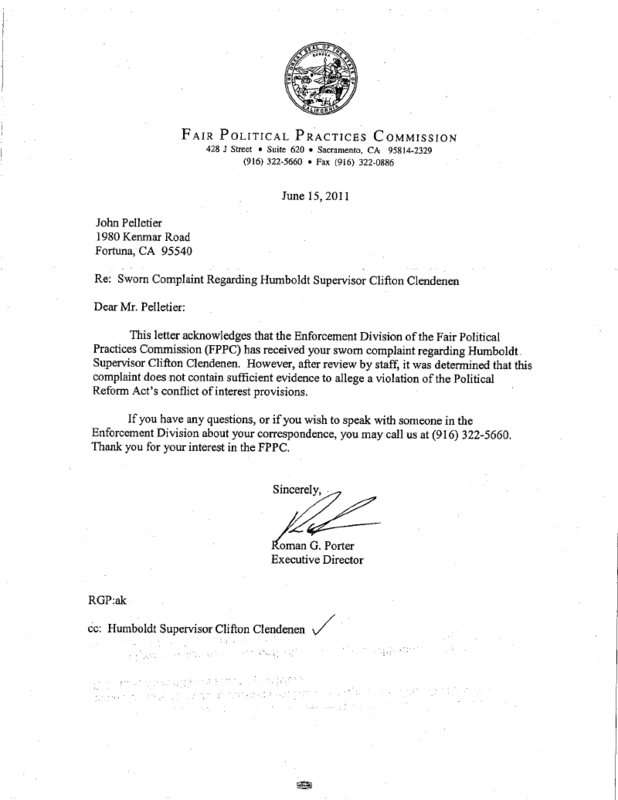 Well, the Fair Political Practices Commission has rejected the complaint declaring that there is no conflict of interest. It will be in tomorrow’s paper. More on this and the redistricting meeting held in Redway tonight to come, either later tonight or tomorrow. Second addendum: the letter. Click on it for more clear image, then again to enlarge. The Times Standard is covering it, so I guess it’s a story, though if every such complaint filed was reported as news there wouldn’t be much room for anything else. It seems to me a stretch a conflict of interest arises because his apple orchard is located near the tracks. The argument is that the value of the property, already next to a major freeway, will decline in value with the presence of a train, or more specifically, the “rail banking” proposed by Chris Weston and his group would, I don’t know, increase the value? But I’m biased. Maybe you have some differing thoughts. A couple of the conservative blogs are all over it. Generally speaking, I think it becomes a story if the FPPC actually calls a hearing. Addendum: Hank is on the story as well. Second addendum: Clif was interviewed for the KMUD news this evening. A great turnout with surprising Sohum representation – and a strong cross-section of political ideology and economic interests represented. A great meal, most of the food coming from local sources, and some of it prepared by local businesses – again, some of it from Sohum. The plan is to win it outright in a year and a month. 13 months ahead really isn’t all that early, contrary to the discussion of the earlier thread. Lots of speculation on potential opponents tonight, about 5 or 6 names coming up. I don’t know what will happen in the long run, but for those who have pledged to remove him from office – you’re up against an energized base and some top rate organizers. I hope the campaign is as positive and policy based as the last. 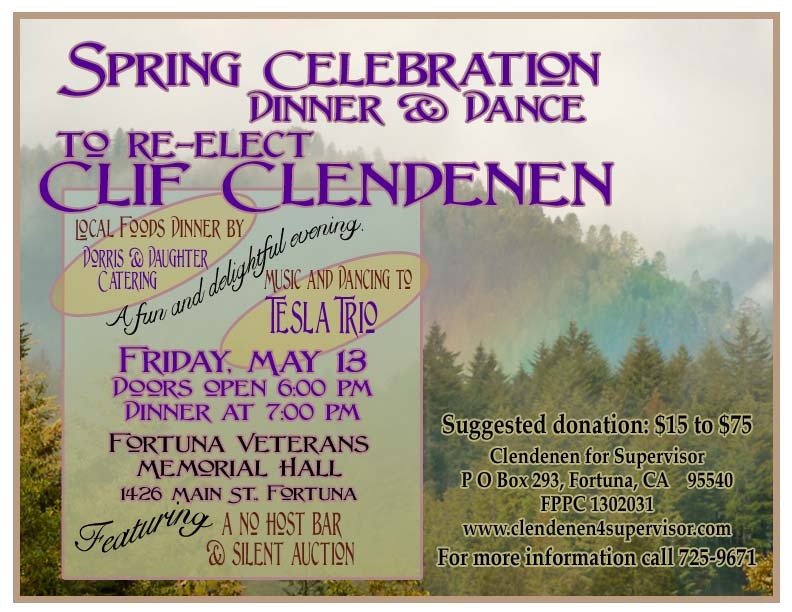 Join Supervisor Clif Clendenen and friends on Friday, May 13 at the Fortuna Veterans Hall to celebrate spring and plant the seeds for Clif’s successful re-election as our 2nd District Supervisor. Enjoy a local foods dinner prepared by Dorris & Daughter Catering. The Tesla Trio will play folk and fiddle music from around the globe with Susan Anderson, and Stephen & Lorna Brown. Doors open at 6 pm, dinner will be served at 7, and there will be a silent auction featuring great getaways, outings, and services as well as fine arts. 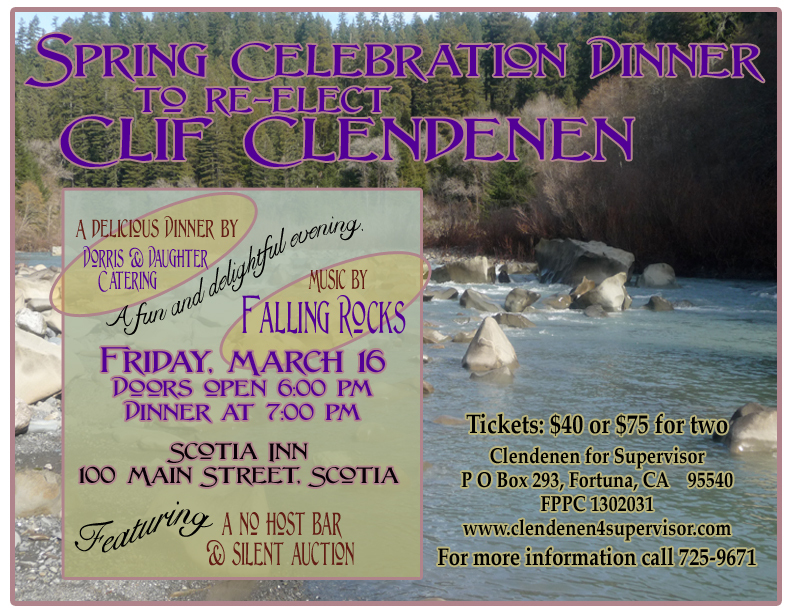 Contact me to purchase advance tickets, or get your tickets at the door for a suggested donation of $15 to $75. Click on the notice to enlarge. While this may seem early, Clif has already been informed by certain powers that be that they will be dedicating their resources to his defeat, although there are only rumors of potential candidates at this time. As always, this blog is an equal opportunity campaign event notice site. I will post any campaign notices I receive regardless of my personal endorsements.